Released in digital format on June 20, 2014. 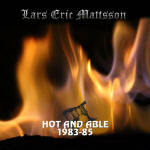 This 16 track album features the music I wrote for and performed with my first serious band Joe Cool between 1983-85. Going through my catalogue I found a lot of stuff I felt was better than what's on my first albums so I definitely think they should be heard. This album is the first in a series of two. Recorded and mixed at the New Lion’s Cage March-May 2014.